I’ve been allocated to a Hospital placement by my Education Provider – how does the BHUDRH fit into the equation? The BHUDRH works in partnership with Far West NSW and Western NSW Local Health Districts to coordinate placements in the Far West, South West and North West regions of NSW. As part of this partnership, the BHUDRH manages all administrative support such as applications, accommodation bookings, schedules and compliance requirements. The North West Academic Centre (NWAC), located in Bourke, handles all placements for the North West region including Bourke, Brewarrina, Cobar, Lightning Ridge and Walgett. The BHUDRH, located in Broken Hill, manages placement in the Far West and South West regions, including Broken Hill, Menindee, Wilcannia, Wentworth, Coomealla, Dareton and Balranald. How is my placement determined? Your Education Provider determines your placement site when they negotiate the placement with us, unless you have arranged an elective placement directly with us. If you arranged an elective placement, then your application will be assessed on suitability, access to public liability insurance, placement objectives, site capacity and accommodation availability. Will my mobile phone work in the remote locations? Telstra is generally the best and sometimes the ONLY provider in remote locations in the Far West, North West and South West regions, and it provides the largest coverage area of any service provider. In the Far West region, mobile reception is available within Broken Hill, however coverage is limited in Wilcannia and Menindee. If you are traveling to Broken Hill in a vehicle, you may find that coverage from providers other than Telstra drop out between towns, and sometimes even Telstra is unavailable. In the North West region, there is limited or no coverage available outside of the township areas of Cobar, Bourke, Brewarrina, Lightning Ridge and Walgett. Brewarrina only has Telstra coverage, so if you have a mobile phone from another provider it will not work. While Optus works within the town limits of all other towns (i.e. Cobar, Bourke, Walgett and Lightning Ridge), if you have another provider please check for network coverage prior to your placement. In the South West region, Telstra is again the recommended choice; other service providers may have limited coverage in certain areas. If you are not with Telstra, we strongly recommend that you consider a Telstra pre-paid SIM or mobile if you are in one of the more remote locations for your placement. It's important to understand that different devices have different capabilities. How each device performs depends on network coverage and device type, make and settings. 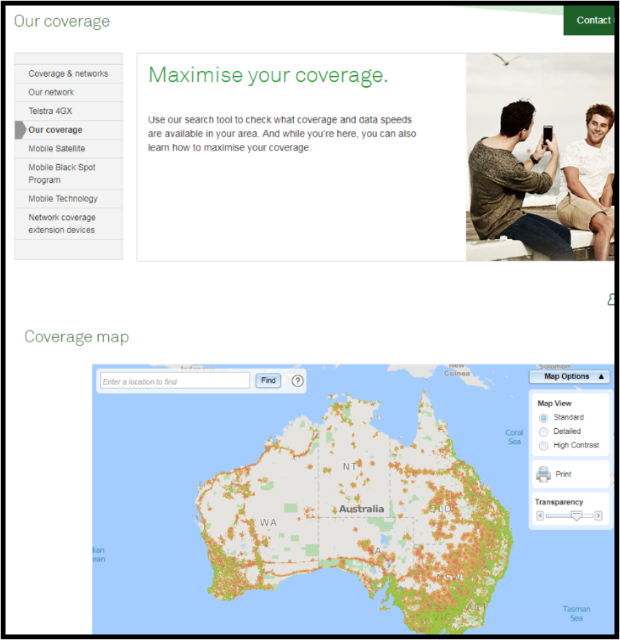 Use Telstra’s search tool to check what coverage and data speeds are available in and around your clinical placement location: Broken Hill (Far West NSW), South West Region and North West region. Do you have camping equipment available? Yes, but currently only in Broken Hill. We have swags available for hire for a refundable deposit. Other than this, please organise your own camping equipment if you would like to go camping. How do I apply for an Elective placement? Please head to the Applications section of this website to submit an online application for placement. Are placements only available for University of Sydney students? No, we accept students from all Australian universities as well as some international students. All student placements are dependent on placement capacity and accommodation availability. Are there any costs for placements? All student placements in the North West, South West and Far West regions that are coordinated by the BHUDRH and North West Academic Centre, including applications processed via the NSW Health ‘ClinConnect’ System, attract a weekly Placement Fee of $25. This fee supports associated administration, education and training, and facility related expenses. The Placement Fee is payable by all Australian university students, and is payable by the first day of placement. Students on placement for 10 weeks or longer will be offered the opportunity to pay the placement fee in installments – this offer will be made via email to eligible students. International university student placement fees are managed separately; students will be advised upon enquiry and acceptance of their application. Are there exemptions for the Placement Fee? Yes, some exemptions may apply. Please refer to the Placement Fee Policy Document for more information. Are placements available for international students? Due to high demand by Australian students, we currently accept applications from overseas medicine, nursing and dental students only, and on a case-by-case basis. All international student placements are dependent on placement capacity and accommodation availability. Do I still need to submit an application if I’ve been allocated to placement by my Education Provider? Yes, it is a requirement for all students undertaking placement in the Far West, South West and North West regions of NSW to submit an online application for placement via our website. Once you have submitted your online application, it will be processed by our Student Program Team within two weeks. Your application will be reviewed by our team and, if a placement opportunity is available, you will be sent an offer via the StarRez Student Portal, which you must either accept or decline. We will inform you via email once an offer is ready for you to review. If your placement is not successful we will inform you via email, and where possible, provide alternative dates for placement if you are flexible on dates. Once you accept an offer, we will touch base regarding anything further we may require you to attend to, such as compliance requirements (including immunisations etc). Between 2-4 weeks from the commencement of your placement, you will receive a comprehensive email covering details such as orientation, accommodation (if applicable), placement schedule and more. Do you have Student Accommodation available for placements? Yes. We have BHUDRH Student Accommodation sites in Broken Hill, Bourke, Brewarrina, Balranald, Buronga, Cobar, Menindee, Lightning Ridge, Wentworth, Wilcannia and Walgett. Can I stay in BHUDRH student accommodation if I am not undertaking a placement via the BHUDRH or North West Academic Centre? Yes, you are more than welcome to submit an application for accommodation only. These requests are handled on a case-by-case basis and are subject to availability. These types of bookings do incur an Accommodation Fee ranging between $50-$100 per week. Are there any costs to use the accommodation? Broken Hill – FREE for bookings from Sunday immediately prior to the placement commencing, to 9am on the final Friday of placement. Requests for a Saturday departure are handled on a case-by-case basis, and if approved will incur a $50 Friday Night Fee per student. All other locations (i.e. Bourke, Brewarrina, Balranald, Buronga, Cobar, Menindee, Lightning Ridge, Wentworth, Wilcannia and Walgett) – FREE for bookings from the Saturday or Sunday immediately prior to the placement commencing, to the Saturday immediately after the placement finishes. Whilst we do our best to ensure that all student placements are supported by student accommodation, sometimes bookings are subject to availability. If capacity is full for your placement dates then you will go on the waiting list and will be required to source your own accommodation at your own costs if capacity does not become available. International students should budget for accommodation charges (refer to international student guide). How far is the student accommodation from where I work? The majority of our student accommodation sites in the Far West and North West regions are within walking distance to BHUDRH facilities and health services, but the distance to other placement sites may vary. Walking to these sites is pleasant most of the year except during peak hot seasons and cool winter mornings. If your placement is not at the health service, please consider bringing a vehicle with you. For placements in the South West region, such as the Dareton, Wentworth or Buronga areas, the distance between your accommodation and host site can range up to 35 kilometres. What do I need to bring for the Accommodation? You must bring your own towel(s). Toilet paper and laundry detergent (starter-packs are provided). Food is not provided, however the student accommodation is equipped with shared cooking facilities. Bed linen, pillows, crockery and cutlery are provided. See FAQ 'What cooking facilities are provided'? for additional information. Will I have to share the accommodation with other students? Yes. All of our accommodation facilities have shared kitchens, dining, living, and bathroom areas, however all bedrooms are for a single student only. We also offer accommodation to non-BHUDRH students who are required to provide National Police Checks to ensure security of all students. Shared kitchens with ovens, microwaves and a full range of kitchen appliances including fridge/freezer and other small appliances (e.g. toasters, saucepans, etc.). The weather in the Far West and North West is usually dry with very little humidity. These areas are referred to as the Living Desert, and as such they experience very hot summers and very cold winters. The warmest time of year is in January and February, when the days can range between 30-45°C, with warm overnight temperatures. The coldest time of year is in July to August when temperatures range between 10-15°C, with cold overnight temperatures between 1-5°C. The South West region experiences hot summers and cool winters. The temperature in winter ranges from 0-17°C, sometimes resulting in early morning frosts, while in summer we experience warmer conditions between 15-42°C. Rainfall is minimal and the air is dry with little to no humidity. The South West Region varies from desert plains to river systems and vast bushland. Can I have mail posted to me whilst I am on placement? You are able to have mail sent to you whilst on placement across the various regions, particularly if you are on placement for 4 weeks or longer. However, please keep in mind that mail does take a lot longer to arrive to rural and remote locations. If mail arrives after you depart, it will either be returned to sender or sent to you as a cash-on-delivery transaction, which is payable by yourself. Click here to find more information on cash-on-delivery costs. We will email to let you know once your mail has arrived. It will be available for collection from reception between 8.30am and 5.00pm Monday to Friday. DO NOT have mail posted directly to the BHUDRH Student Accommodation as we cannot guarantee security of mail at these sites. You MUST let the team at the North West Academic Centre know that you are expecting mail. If you are undertaking placement at a site outside of Bourke, then the mail will be taken to you by the team when they are next visiting your site. If you are undertaking placement at a site outside of Dareton, all mail will be delivered to you by a team member when next visiting your site. We strongly recommend that you bring a car with you for your placement, especially if you are on placement for 4 weeks or longer. The main roads are sealed to each of the following placement destinations, including Broken Hill, Menindee and Wilcannia. A vehicle is essential if you are placed in the North West regions of Bourke, Brewarrina, Walgett or Lightning Ridge and South West regions of Dareton, Wentworth or Buronga, as it can be a 35 kilometre drive between student accommodation and your placement site. Public transport is not overly affordable (taxis) or conveniently available (buses) in these regions either. If you bring your own vehicle, ensure it is mechanically sound to cover long distances, particularly if travelling during the summer periods. If travelling by car ALWAYS plan your journey to avoid driving at night, dusk and dawn, due to the very active wildlife and open range properties. Avoid dirt roads where possible whilst travelling to your placement destination. Also ensure you travel with plenty of water - summer and winter! Broken Hill does have a public transport system and the BHUDRH has mountain bikes available for students’ use, which is organised on a booking system (please refer to Accommodation Guide). Please also refer to the NRMA website and the RTA Road Safety website for further advice regarding travelling on country roads. If I don’t have a car how do I get around? Walking, Public transport and taxi services (Broken Hill only) would be your best options. We currently only have mountain bikes available for students’ use in Broken Hill on a booking system. Are there snakes in Broken Hill? Snakes are found all over Australia and Broken Hill is no exception. Snakes are not naturally aggressive and always prefer to retreat. They will only attack humans if hurt or provoked and most bites occur when people try to kill or capture snakes. If you come across a snake in the bush, just calmly walk the other way (The NSW National Parks and Wildlife Service, Office of Environment & Heritage, 2018). See Snake Catcher, Wayne on Facebook for handy tips and advice about our local reptiles.